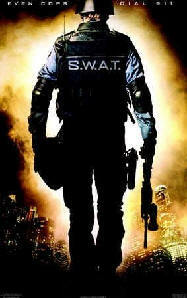 A S.W.A.T. team has the task of expelling a team of villains from the arena. The Villains will start the game on the upper level. The S.W.A.T. team will wait in the armoury until the mission begins, but then must enter the arena immediately. Each player has a limited number of lives. Each time they are deactivated, a life is lost. When all of their lives are gone, they are eliminated from the game. The players� goal is to eliminate the other team, while not being eliminated themselves. Players must actively search out their opponents. If a player fails to do so, their battlesuit will warn them by saying �Warning, Time low�. If they do not find an opponent within a short period (about twelve seconds), their battlesuit will say �Warning, Time critical�. If a further twelve seconds passes without them finding an opponent, they will be deactivated and a life will be lost. Thus, players must continuously search out the enemy or they are penalised. The number of lives each player starts with is determined by the computer and takes into account the skill levels of all the Villains and S.W.A.T. team. The battlesuit will provide warning messages when lives become low. ABSOLUTELY NO FOLLOWING IS PERMITTED. Players they must be permitted to escape when they are deactivated. Player that are Level three and above, zapping their own team will be deactivated and will lose one life. The Villains have the only special ability available, payback, which costs them ten special points to activate. The number of lives each player starts with depends on that player�s standard skill level. The mission will only end when one team is eliminated.